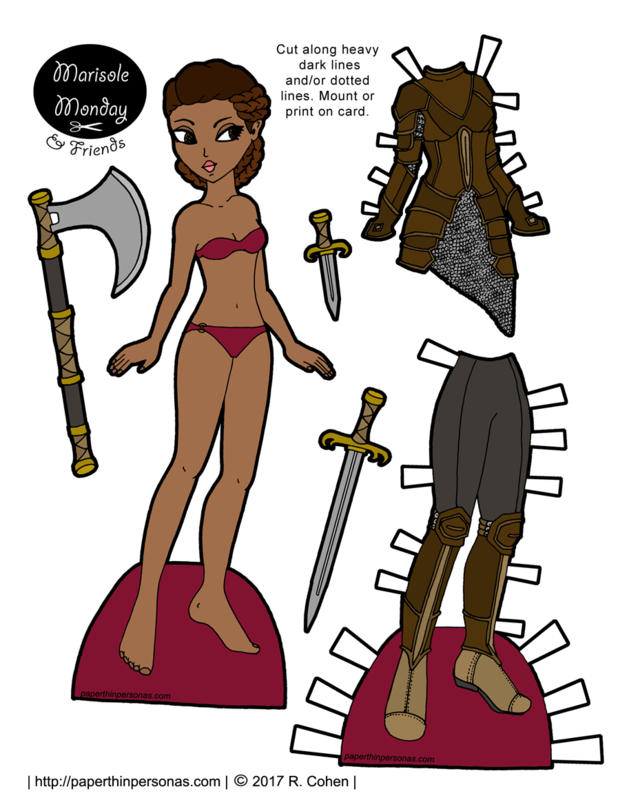 Today’s paper doll is Marisole in some leather armor over some chainmail. I wanted her hair to both be lady-like, but also practical. Every paper doll needs some weapons as well. But there’s bigger news today than this paper doll, I gotta say. When I set a goal, I tend to reach it. I don’t stop until I meet my deadlines. When I say there will be five posts a week, than by gosh there are going to be five posts a week. This can be a great trait, but it also means sometimes I need a swift kick in the rear to realize that I have to set realistic goals. As some of you know, I am starting a graduate program in the fall while also working full time. Originally, I planned to create 60 paper doll posts for August, September and October. Except I couldn’t do it. Every time I picked up my pencil, I felt intense stress. What if I didn’t make enough paper dolls? What if I failed? What if I let people down somehow? I want to enjoy my hobby and be realistic about what I can or can not get promise my readers. I can’t keep up the current pace of production, work full time, be in grad school, and have any time for anything else. The big news is this: The blog will be switching to a three day a week schedule- Monday, Wednesday and Friday. There maybe an extra post here and there when I feel like it, but no promises. I am contemplating different changes as well, such as doing a Marisole Monday post every Monday, again, but truthfullly I haven’t decided quite yet what exactly the future will look like. For now, I hope you enjoy today’s paper doll warrior. There will be a new addition to the 1920s Poppet series on Wednesday. As always, I love to hear from you all in the comments. Back when the Sprites started, I had planned to start with a lady paper doll as the first Sprite. However, I’d decided to name them in reverse alphabetical order. I find if I have a naming scheme it makes coming up with paper doll names easier. So, I was stuck with starting with Z. There just aren’t that many names that start with Z, so I started with Zachary here instead of starting with Yumiko. I’m sure you all really cared about this random piece of paper doll blog history. Anyway, I do think there are advantages to contemporary dolls. I think they sort of act as basic options. There’s no colorful hair here, so this version of Zachary could be a mermaid or he could be going to the park or borrowing this nifty elf armor, The point is that he’s a bit more neutral than the two pervious Zachary versions I have created. Tomorrow, there will be a contemporary fashion Ursula to join Zachary. Meanwhile, if you want to support the blog on Patreon I would be mighty appreciative. If you are interested in the process of how I work, there’s a behind the scenes blog there. Alternatively, you can follow the blog on facebook for blog updates, some random sketchbook photos (which my Patrons see first, I confess), fun historical fashion things I find, and picks from the Archives. 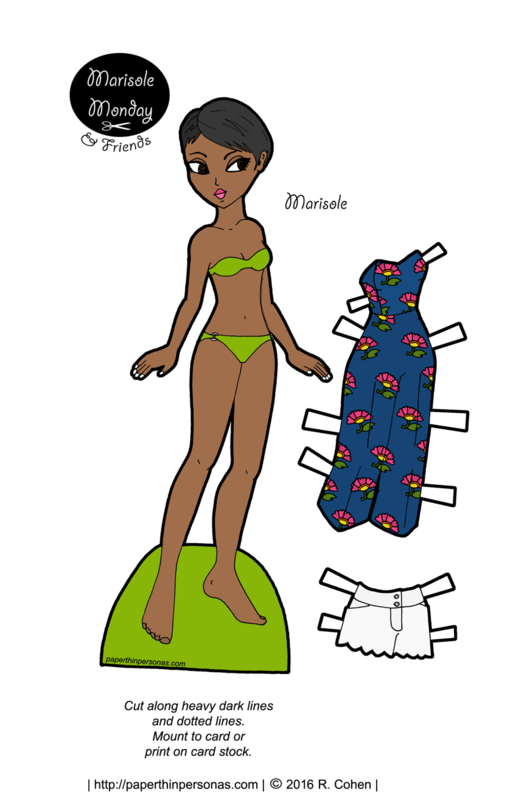 Looking for something for today’s Sprite paper doll to wear? Pick out some clothing here. 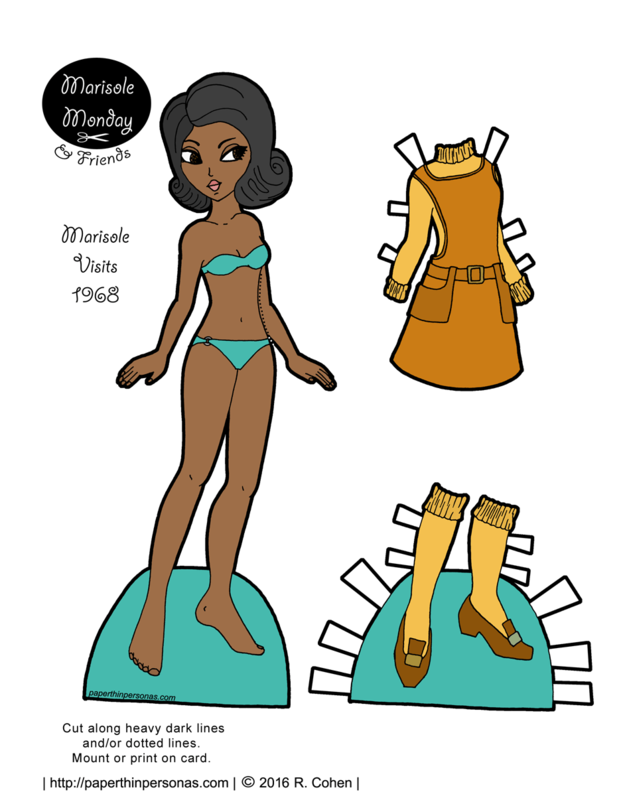 I created today’s printable African-American paper doll from the Marisole Monday & Friend’s series after I was inspired by this amazing vintage pattern cover from 1968 that I found on Pinterest. Brown skinned models don’t show up on pattern covers from the big name companies until the 1970s, but that doesn’t mean there weren’t brown skinned girls wearing and making the fashions. The omission of diversity in historical fashion related documents is the result of the institutionalized racism of the time, but doesn’t indicate a lack of the presence of people of color in fashionable dress. And now that I have finished my Primary Source Literacy explanation for the day (a danger of being a Special Collections Librarian), we can get back to the paper doll. My only big frustration with today’s doll is her hair. I tried to get that 1960’s bouffant sorta look with her flip and I just don’t think I quite got it right. People say the 1980s were a time for big hair, but I think that is because they haven’t seen the 1960s. Teasing and hairspray were big things. I love Pinterest for collecting paper doll inspiration and I have a whole 1960s fashion board, but things there often lack contextual information, so I tend to be pretty critical of what I use. I know I have readers who were alive in the 1960s, so let me know how I did with today’s paper doll. Did I do justice to that decade? It was, I have to say, a bit before my time. Love the blog? Think about donating through Patreon. Today’s Printable Paper Doll Inspirations: Pageant Hair, The Toddler Paper Dolls of Paper Doll School, A Pixie Set Called Dionsia, and Boots Made for Walkin’. Can I confess that my favorite part of today’s curvy paper doll to print are those amazing boots? I want them. I don’t know where I would ever wear them, but I would find a way. For a while, Julie of Paper Doll School was making Toddler Paper Dolls inspired by some of her older paper doll sets. Like this toddler paper doll set named Riley is based on an older set named Ruby. I thought this was a really cool idea, but wasn’t sure how to develop it my way. On occasion readers have asked if I could redraw something from one paper doll series for a different series. I’ve always said no. Drawing the exact same outfit again sounded boring. But watching Julie’s process, I was inspired to look back at my own work and see what ideas were sparked. So, today’s curvy paper doll to print from the B&B series is based on a Pixie paper doll named Dionsia. The paper dolls share a color scheme and Dionsia’s clothing inspired both today’s gown and tomorrow’s gown- both for my curvy B&B paper doll series. If you love the blog, than think about supporting it by becoming a Patron. There’s perks like a unique paper doll series and behind the scenes images. If you’re not up for that, consider following the blog on Twitter and/or telling a friend about it. 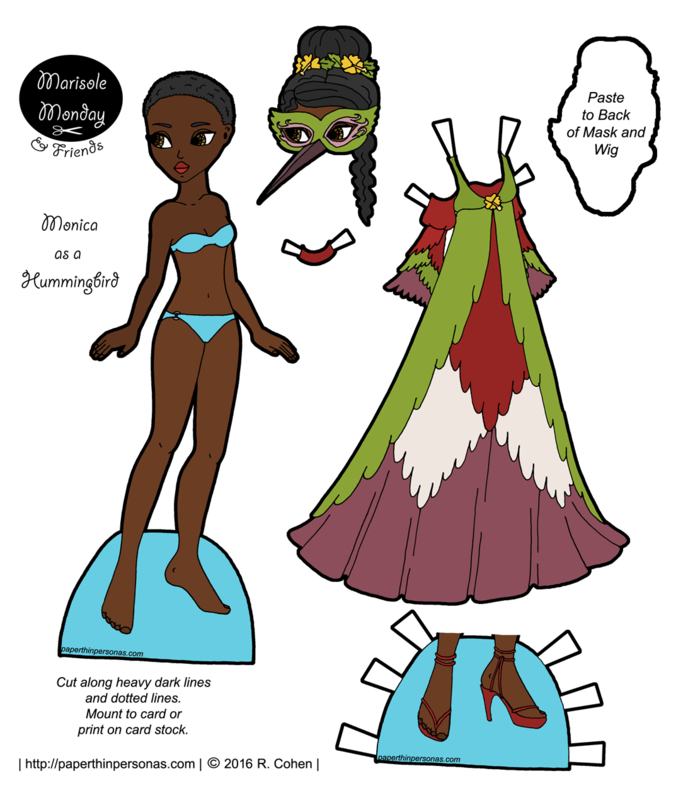 Tomorrow, there will be another fantasy gown inspired by the Dionsia paper doll set and owls. Love the paper doll? Hate the paper doll? Just wanna tell me something? Leave a comment! Need to get some more clothing for this Bodacious & Buxom paper doll to wear? Pick out some clothing here. A few things, every dress this week was colored based on the color scheme of an older paper doll set which I thought was kinda a cool idea. Plus it saved me from having to come up with color schemes all my own. See? Saved by my own laziness. And just making it long and simple. If you’re thinking, her hair is boring, I want a different model… I’ve set up a Dolls category and a Clothing category for the Bodacious and Buxom paper dolls and I am currently working on populating those categories for the other paper doll series. So, you can find all the dolls and all the clothing. Meanwhile, please feel free to follow the blog on Twitter @paperpersonas. And if you love it, support it through Patreon. Patrons get early previews, extra outfits and to listen to me ramble about process. And who doesn’t want to listen to me ramble about that? Patron or not, I hope you enjoy today’s paper doll and her dresses this week.